Normally, eLearnSecurity Decembers are reserved for holiday greetings and year-end deals—as with everybody else—and that’s perfectly fine most of the time. But, with the momentous year we’ve been having, it didn’t feel right to close this one out just like that. No way, we wanted to end it with a bang! And yes, we’re also just way too excited that we couldn’t let 2017 pass without this. 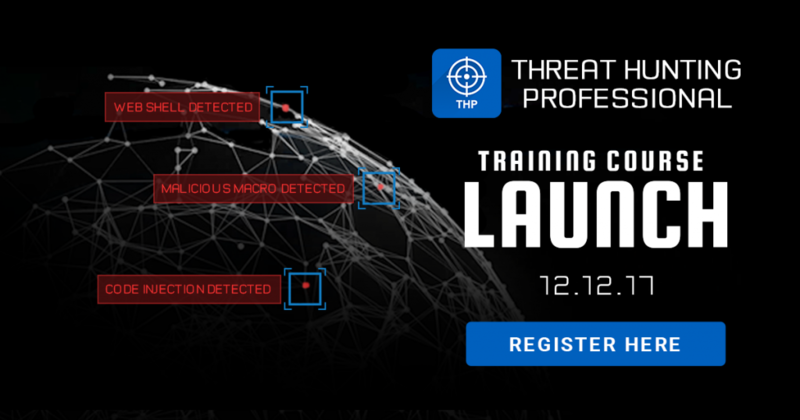 So, we are inviting you to join us on December 12th as we launch: the new Threat Hunting Professional training course! Military operations often begin with reconnaissance missions: deploying special forces units into surrounding areas to gain information on enemy combatants. In some cases, recon missions also involve mounting an offensive in order to elicit a response that would reveal tactical data such as strengths and weaknesses, or even to deal a decisive blow. This is the mentality behind Threat Hunting Professional. Nobody wants to have their security teams merely reacting to a threat or attack—if you can spot an attack happening, it’s probably too late. Blue teamers have to seek out enemies around the perimeter in order to secure their positions. With THP, security professionals will be instilled with a ‘hunter mindset,’ and be taught the skills to proactively hunt threats in the network or endpoint. Based on the latest attacker TTPs, and using Threat Intelligence and IOCs, the course will help defenders keep their organizations several steps ahead of potential adversaries. Red teams will also find immense value in THP. Similar to how a military counter-recon team’s knowledge and experience with recon operations allows them to avoid detection, red teamers will come out of the course as better, stealthier penetration testers. By familiarizing themselves with advanced detection techniques used by mature organizations, as well as the most commonly-analyzed events, students will learn how to keep their attacks under the radar. If it isn’t obvious by now, this isn’t your usual defense course. We won’t keep you waiting for much longer. Our latest training course (—something you’ll be hearing from us a lot more now) launches on December 12, 2017 – 1:00 PM ET. Be a part of the live launch webinar by signing up here. Since it’s the ‘season of giving’, you may want to invite friends and colleagues to join—attendees will get the chance to win prizes and get the first shot at our #ThreatHuntingPro deals!